It’s that time again – time for some great products at awesome prices! Oh my gosh – those markers are the Current In Colours! What a steal! Hearts are not just for Valentine’s Day – grab the Happy Heart Textured Embossing Folder before wedding season starts; you’ll be glad you did! Of course Graduation is all about the ‘stars’ who worked hard all year, and made it! Actually, I’ve used the stars for birthdays, Christmas, graduation; your imagination is the limit! 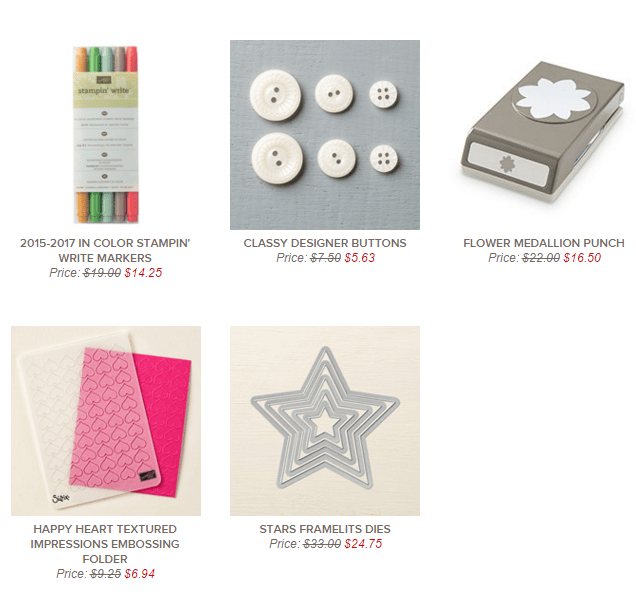 The fabulous Flower Medallion Punch coordinates with the super fun Crazy About You stamp set (pg. 106, Annual Catalogue). You can combine any of the Weekly Deals with any other products you’re ordering – whether it’s from the Occasions or Annual catalogue, or the Clearance Rack, they can all be combined on the same order. Plus, it all counts towards earning you a FREE Sale-A-Bration item; once your order reaches $60 (before tax/shipping) you instantly qualify! By the way – speaking of getting a jump on upcoming occasions – did you know that there are 7 bundles from the Holiday catalogue that you can still buy? That’s right – flip to page 48 of your Occasions catalogue, and you’ll see the bundles, plus the Oh, What Fun! stamp set, that you can still purchase at the special Bundle prices! There are other items that have carried over that you may not be aware of – LOOK HERE, and make sure you’re not missing out on anything, like the Fine-Tip Glue Pen, Red Foil Sheets, Precision Base Plate, and more! To place your orders, either contact me directly & I’ll do it for you, or click on my signature below to go direct to my online store, where you can shop 24 hours a day! Previous Previous post: Wacky Watercooler Blog Hop – Let’s Celebrate!